Why am I looking forward to The Name of the Star by Maureen Johnson? Typically, I love stories set at boarding schools and well, stories that are set overseas (or across the pond, as it stands) are always a refreshing change from stories set within the United States. On top of this, the main character is the only one who can see this guy? Very interesting. I can't wait to see how the story unfolds--and well, I loved 13 Little Blue Envelopes. On top of all this? I'm loving the cover. 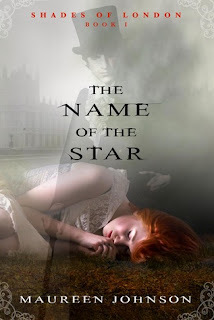 The Name of the Star by Maureen Johnson is published by Putnam (a part of Penguin Group) and its expected publication date is September 29, 2011. I love Maureen Johnson, so this is a definite add to the list. Thanks for posting it! Well, I love the cover. And I've really enjoyed everything Johnson has written -- so that's enough to make me want this one! I've only read a couple of Maureen Johnson books so far, can't wait to read this one. I'm so looking forward to this read! For awhile now! Glad to hear I'm not the only one! I haven't read anything by this author yet but this looks interesting. Thanks for the review.